According to the National Highway Traffic Safety Administration (NHTSA), there are more than 660,000 drivers in the United using a cell phone or electronic device at any daylight moment by the year. Cell phone usage is highest among 16 to 24 year old drivers. Females are more likely than men to be in a fatal crash while using a cell phone. According to NHTSA, 3,477 people were killed and 391,000 were hurt in motor vehicle accidents attributed to distracted driving in 2015. That’s up from 3,300 wrongful deaths and 387,000 injured in 2011. In a big state, like Texas, in 2017, the total crashes on Texas roads was 537,475. Of those, 100,687 or 19% involved distracted driving (driver distraction, inattention or cellphone use). The 100,687 crashes in Texas resulted in 444 deaths and 2,889 serious injuries. These distracted drivers are a threat to every motorist, cyclist and pedestrian with which they share the road. On average, 18 percent of all car accidents nationwide that resulted in injury occur because a driver is distracted. Drivers who use a handheld device while behind the wheel are four times as likely to be involved in a car wreck that causes injury. People who text while driving are 23 times more likely to be in a car accident. Drivers who send or read a text message or email while driving look away from the road for 4.6 seconds on average. At 55 mph, a car could go the full length of a football field with the driver’s eyes off of the road. A driver using a cell phone devotes 37 percent less brain activity to driving than someone actually paying attention to the road. While most drivers know the dangers, many send and receive texts or use a cell phone anyway. The CDC reported that 69 percent of U.S. drivers ages 18-64 said in a survey they had talked on a cell phone while driving in the past 30 days. Another 31 percent of drivers said that they had sent or received a text or email message while driving during the previous 30 days. Drivers cannot send or receive electronic messages. Over 90 Texas cities have adopted local restrictions. In 2013, West Virginia’s state laws against using handheld cell phones while driving became subject to primary enforcement. The law went into effect that summer, after a year of secondary enforcement in which police needed another reason to stop a motorist observed breaking the law. Text messaging and using handheld cell phones are illegal for all drivers in West Virginia. Teenagers with learner’s permits or intermediate licenses are prohibited from using wireless communication devices while driving. School bus drivers may not use cell phones while operating the vehicles. Unfortunately, not all drivers obey these personal injury laws. Starting a car accident case against an insurance company after a distracted driving crash can be stressful when suffering from medical problems, lost income and mounting bills. 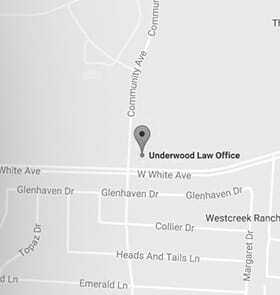 The experienced personal injury lawyers at Underwood Law Office can help. You can focus on your health and recovery while knowing your rights are protected. Our McKinney, Texas law firm serves all of Dallas and Fort Worth, including the Plano, Frisco, Allen and McKinney. Our Huntington, West Virginia accident attorney office serves all of West Virginia. For both offices, call our toll-free number 844.UNDERWOOD (844.863.3796) for a free consultation with a personal injury attorney about your potential auto accident injury case. You pay no fee unless we win.